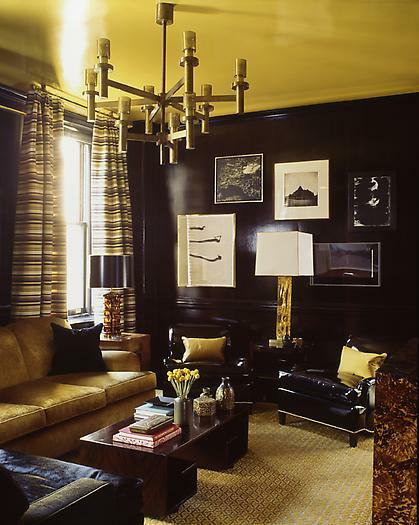 Ceilings are often the most forgotten part of a room. I admit I don't often look up and think I should do something with a ceiling, I mean its just there out of necessity. But from this moment on I vow to look up more and think of the ceiling as a 5th wall and do something with it! The designers of these georg rooms did something and did it fabulously I might add. I agree, I don't always look up, but after seeing some of these, I think I will! 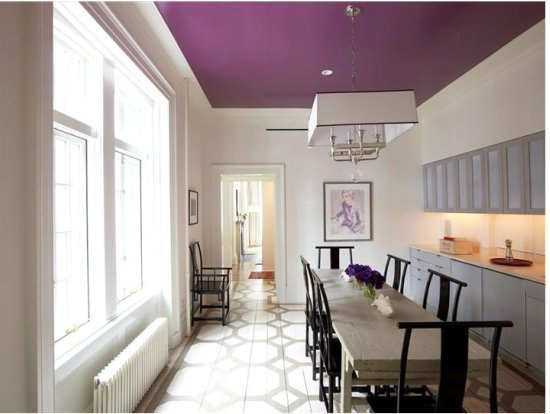 That last photo is gorgeous, love the purple ceiling!! I so LOVE painted ceilings. completely agree, it IS a 5th wall. I've always loved the idea of a painted ceiling. I painted the ceiling one room, and people really don't look up and don't even notice it on the first visit! 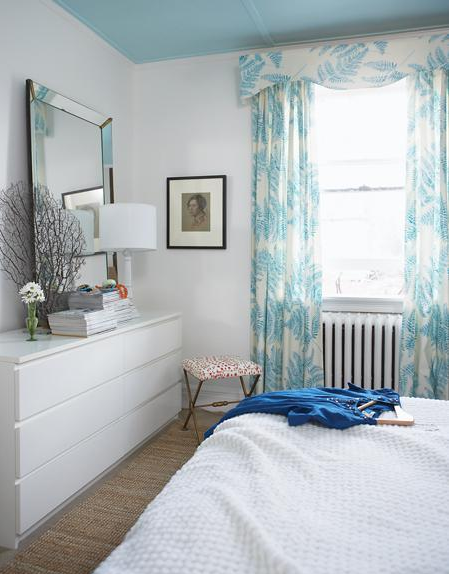 I adore my light blue bedroom ceiling! Kind of want to do others in the house, but it could get into overkill territory pretty quickly! I love a pale pink ceiling (very flattering on skin) or a pale blue (very sky-like). I currently have a stormy gray-silver ceiling my bedroom and I love it...really makes the room cozy. We *just* panted sample colors on our ceiling last night. I sure isn't easy to pick a color though. It totally makes the room, doesn't it. I love all those ceilings! Expecially the striped one. Beautiful! Don't forget the ceilings!!! I just showed a house with those exact same windows in the first picture over looking the bay! It was breathtaking! I have been thinking about painting my ceilings. Great post. You are so right. Unfortunately, I find that a good many of my clients are so scared to make the jump to color on the ceiling. They are so dead set on using white and it kills me. I can talk most of them into subtle color but I'm still waiting for one that will let me do something dramatic like stripes. That first room has been in my inspiration folder for a long time. LOVE these and I'm inspired to paint now!! Thanks for this. My home need some ceiling work. 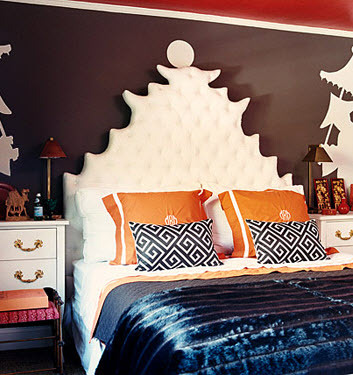 A painted ceiling adds so much to the room ~~ without even realizing it! Love this post! I too love accenting the ceiling. 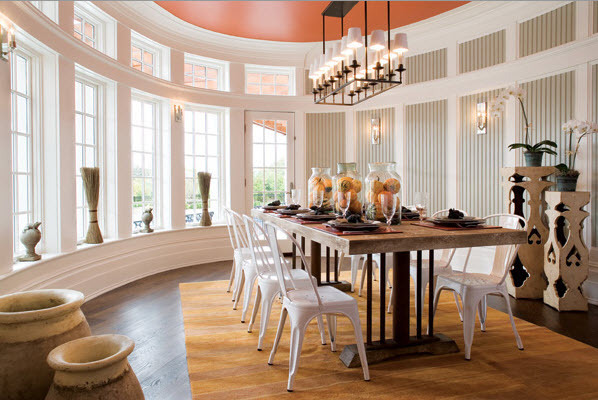 Barry Dixon used grass cloth and nail heads on the recessed area of a coffered ceiling! Check it out in his book.